Let’s Finish Mending the Nets—It’s Time to Go Fishing! Last week, we heard the story of Jesus’ call to Philip and Nathanael, as recounted in the Gospel of John. This week we get yet another story of a call to ministry, this time from Mark’s Gospel. It takes place immediately following Jesus’ forty days in the wilderness being tested by Satan. The news of John the Baptist’s arrest signals the end of Jesus’ testing and the beginning of his active ministry in the world. And so, he leaves the wilderness behind and heads for the Sea of Galilee. The message that he proclaims at first is one of repentance: “The time is fulfilled, and the kingdom of God has come near; repent, and believe in the good news.” Nowadays, after having heard so many hypocritical televangelists tell us that we need to repent of our sins, we have a hard time hearing Jesus’ message of repentance with fresh ears. And so we get it wrong. We take the word “repent” to mean “to be sorry for our sins.” But that’s not the core meaning of the original Greek term. A more literal translation is “to change one’s way of thinking.” In other words, Jesus was telling those who were willing to listen that the world was on the brink of a radical transformation and they would need to change their outlook. Yes, this would undoubtedly have included being sorry for one’s sins. But the call to change one’s way of thinking includes so much more than that. Next, we are told, Jesus begins to call a group of disciples to help him in his work, starting with the two brothers Simon Peter and Andrew. 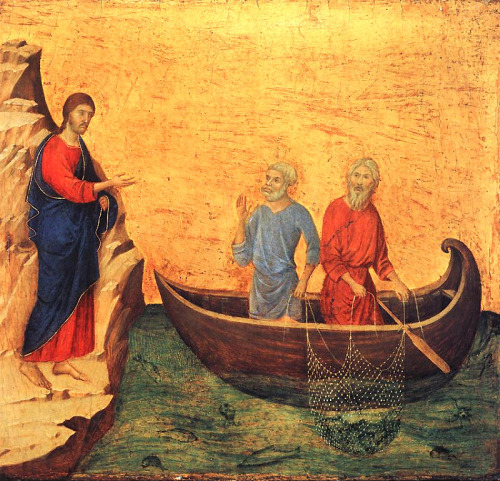 Jesus calls these fishermen to follow him and become fishers of people. And they do just that—without a moment’s hesitation! They abandon their livelihood and their families to accept the invitation of this itinerant rabbi. Likewise, the brothers James and John drop what they are doing to follow Jesus. Now, Jesus must have been an incredibly charismatic man and his invitation to join him must have been incredibly persuasive. Even so, these fishermen displayed tremendous courage, and we should give them due credit. It’s already the second Sunday of Advent—how time flies! For many of us, this season is a frenzied time of Christmas shopping for friends and family. But there is more to this season than that. It is a time to pause and to consider the two advents of Christ: the first in Bethlehem some 2000 years ago and the second, when Christ will come again in power and great glory. And as we consider, we also prepare. Like our ancestors in the faith, Christians today look to prophecy to guide us in our preparation, to point us in the right direction. And like our predecessors, we find that God’s oracles can speak different messages in different times. Today, we heard an excerpt from Isaiah chapter 40 and an echo of that same scripture in the Gospel reading from Mark. 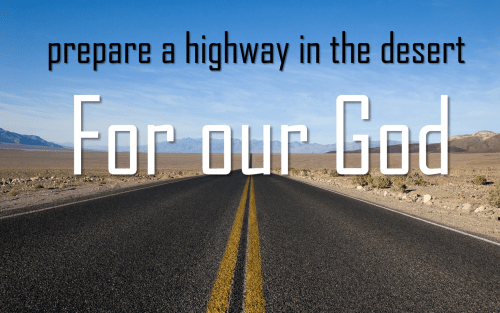 Isaiah spoke of a voice crying out to prepare a highway in the desert for our God. The ravines are to be filled in. The hills are to be leveled. And when this roadwork is done, God’s glory will be revealed to all. (It sounds a bit like a press release for Caltrans!) When these words were originally prophesied, the Jews were living in exile in Babylon, pining for the day they could return home. With this oracle, Isaiah prophesied the eventual vindication of the Jews. A highway would be made through the desert separating Babylon and Jerusalem, and God would lead his people home in glory. (Interestingly, Isaiah doesn’t make it clear who exactly was supposed to build this divine highway, whether God’s angelic minions or the Jews themselves.) This prophecy would seem to have been fulfilled with the Jews’ return from exile and with their rebuilding of the Temple in Jerusalem. But then again, maybe not! Yes, it’s still Easter! And yes, your sins are forgiven! Today is the third Sunday of Easter, and yes, it’s still Easter. It will continue to be Easter till we reach the feast of Pentecost on May 24th. There are various ways that we mark this joyous season. We use festive vestments of white. We read the Acts of the Apostles in place of the Hebrew scriptures. We include extra Alleluias. And finally, the Confession is optionally omitted. During this season, we pause for 50 days to experience the Day of Resurrection and to consider its consequences for us as disciples of Jesus. It’s kind of like the movie Groundhog Day, in which Bill Murray’s character experiences the same day over and over again till he learns his lesson. But this seasonal focus on one point in time, the Day of Resurrection, is belied somewhat by today’s first two readings. The first reading from Acts takes place some months later, after Pentecost, and mentions the Resurrection only in passing. And the second reading from First John takes place about 70 years after the Resurrection of Jesus and doesn’t mention the Resurrection at all. Only the Gospel reading actually takes place on that first Easter Sunday. Despite these disparities, all three readings do share common threads. So after a quick review of each of the readings, I’ll attempt to tease out two of those common threads. Let’s start with the Gospel reading. This account from Luke tells his version of the appearance of the Risen Lord to the disciples. It is basically the same story we heard last week, but with some differences in detail. For example, Luke spares Thomas the embarrassment of being the only doubting disciple. 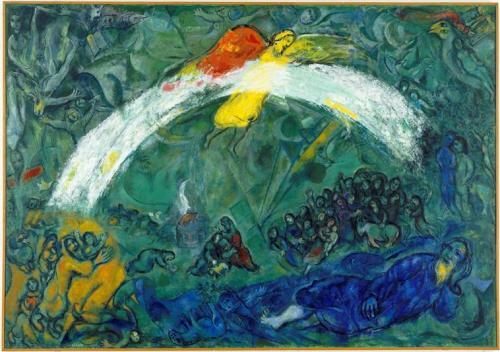 In today’s account, all the disciples display doubt at Jesus’ appearance in their midst. And Jesus invites them all to touch him, so as to verify that he is not a ghost. Then, as the final proof of his physicality, he asks for some food. Now as both a vegetarian and a preacher, I devoutly wish that the disciples had given him a loaf of bread. But what they gave him was a piece of broiled fish. 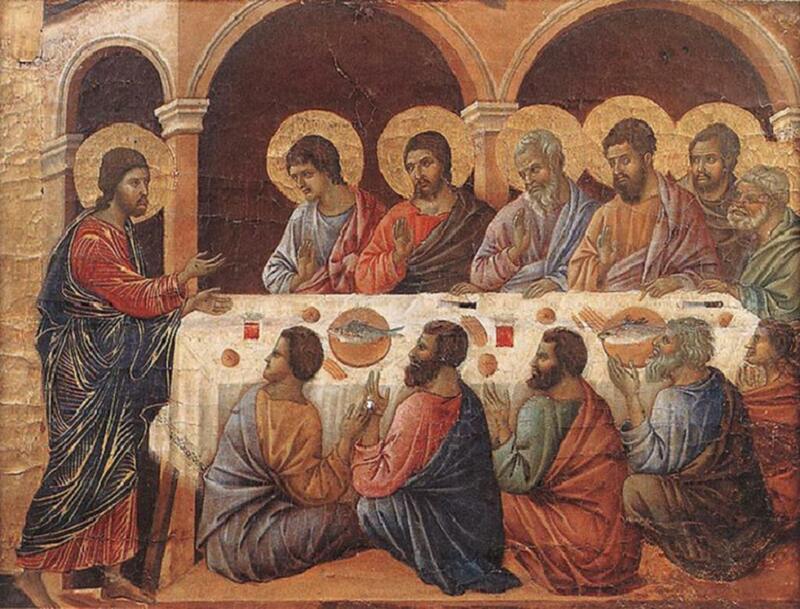 Now, if he had shared bread with them, as he did with the two disciples on the road to Emmaus, I could expound at great length on the eucharistic symbolism of the broken bread. As it stands, I am at a loss to explain the religious significance of broiled fish! Jesus proceeds to teach the disciples, opening their minds to understand the scriptures, with a particular focus on the fate of the Messiah. Jesus ends the class with a homework assignment: to proclaim repentance and forgiveness of sins in his name to all nations.